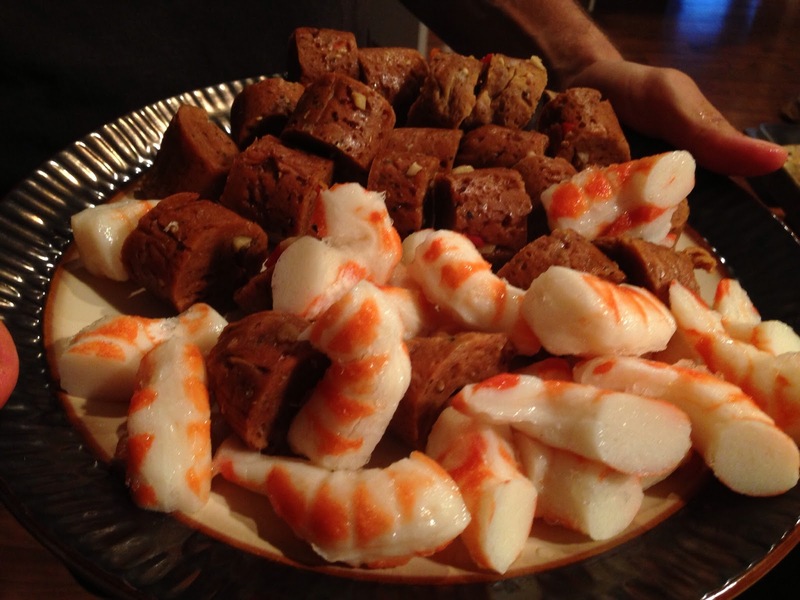 With the 2017 Super Bowl upon us, here is a great finger food recipe that will wow the party. I grew up with lox and cream cheese brunches. While I never could get into eating smoked salmon, this carrot version is arguable better tasting and certainly more healthy. Enjoy! Use a vegetable peeler to peel carrots into thin, flat strips, as wide as possible. 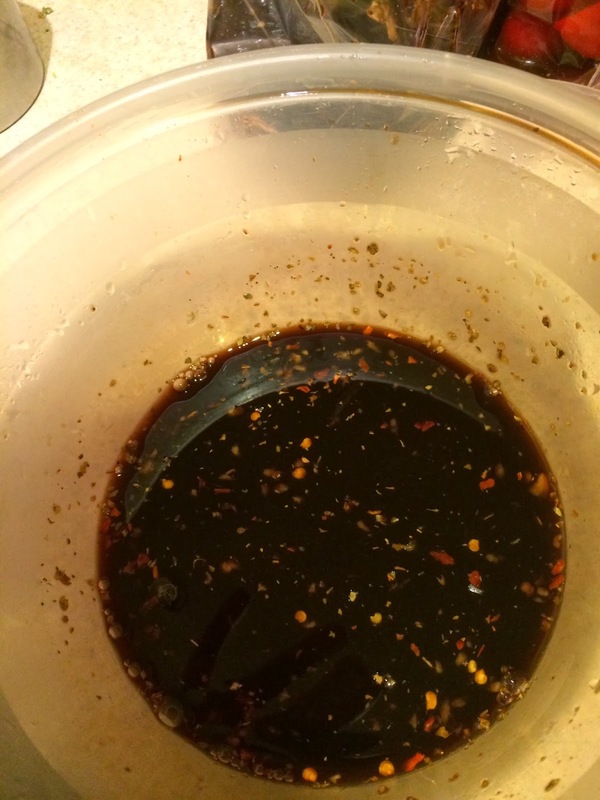 In a bowl, whisk tamari, liquid smoke and seasoning. 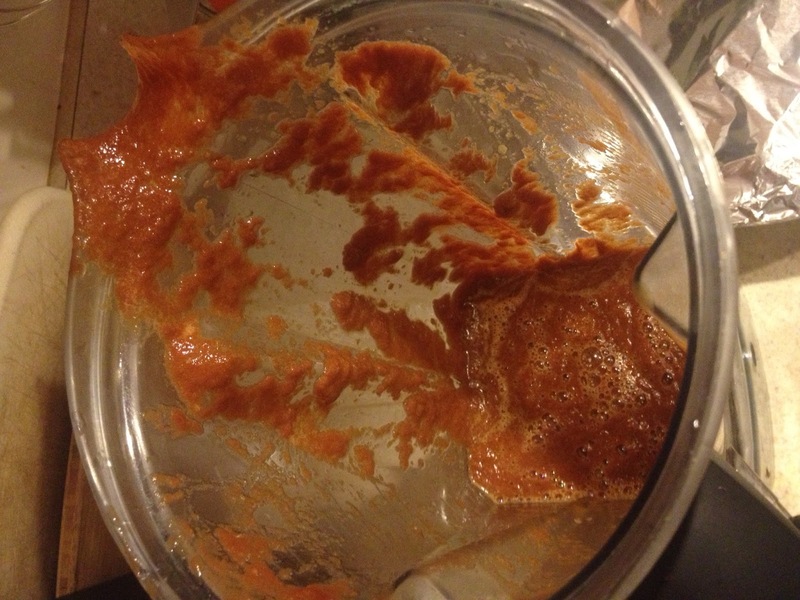 Toss carrots in marinade. 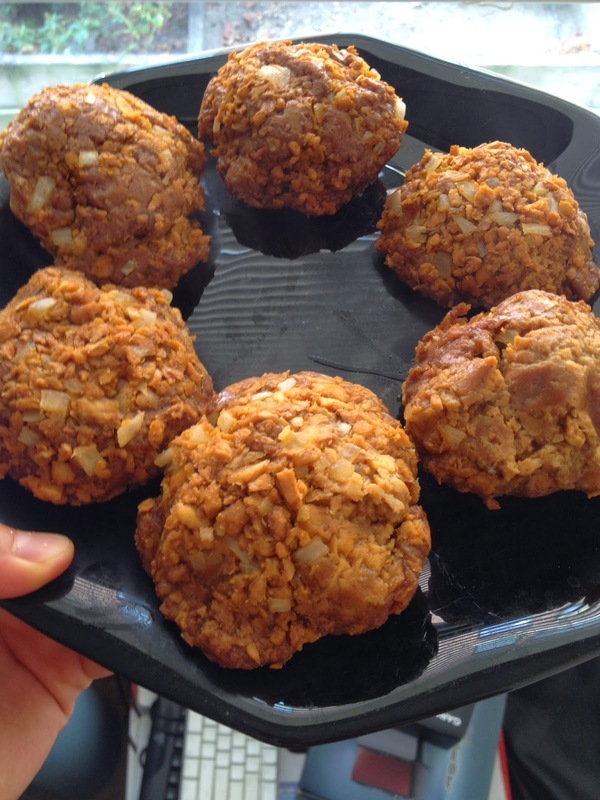 Wrap in a sealed foil pouch and bake for 30 minutes. Remove from oven and let cool. Refrigerate until time to assemble the crackers. 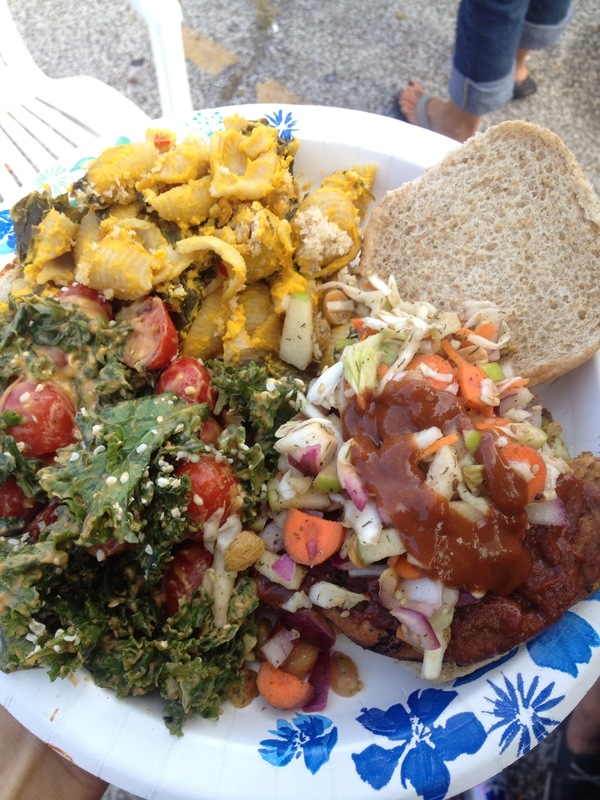 The vegan tailgate is going strong! Not to be confused with the Bucks of Ohio State, the Browns took on the Tampa Bay Buccaneers this past weekend in Cleveland. 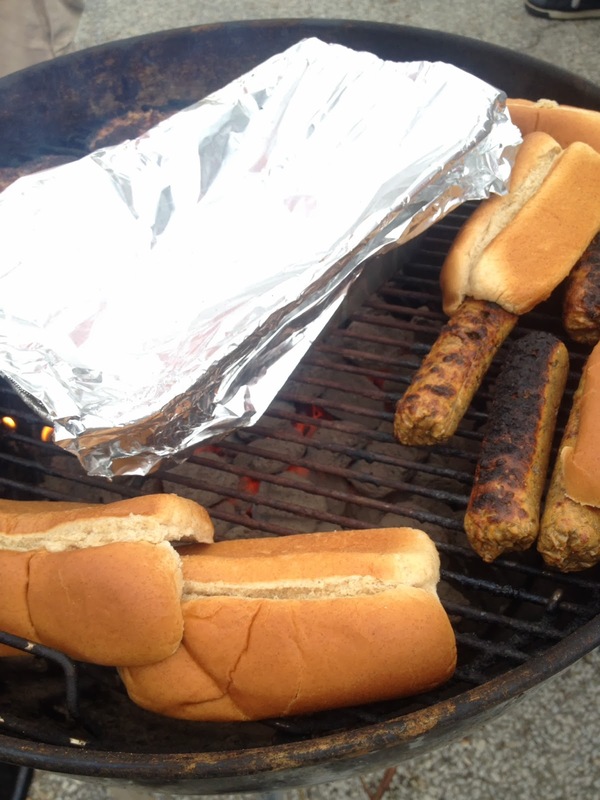 Perfect football weather made for perfect tailgate conditions. And the Brown won! 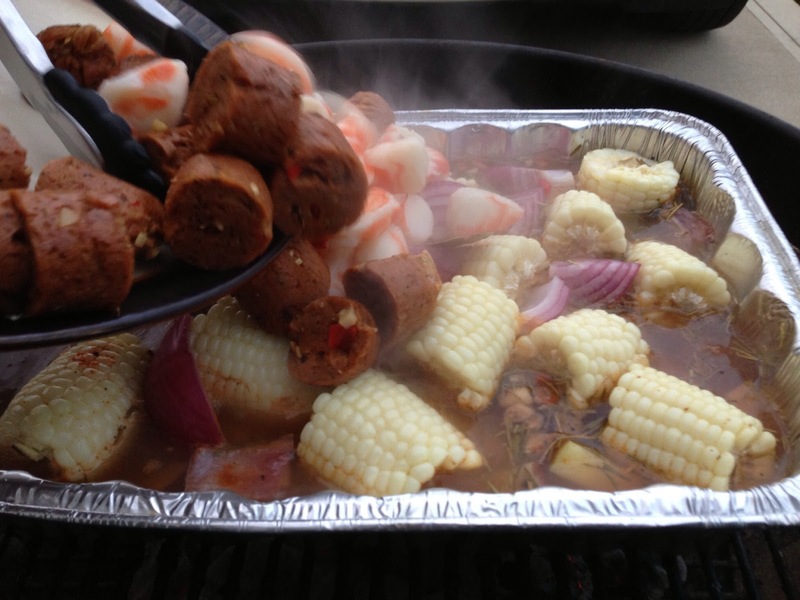 The Browns have a winning record and this recipe was quite the crowd pleaser. 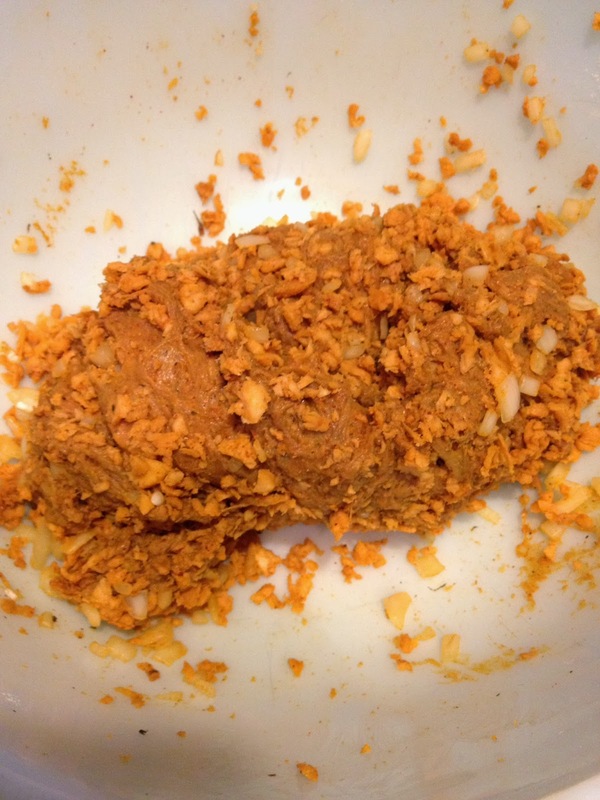 This is another seitan recipe, so if you follow the blog you are basically an expert by now! 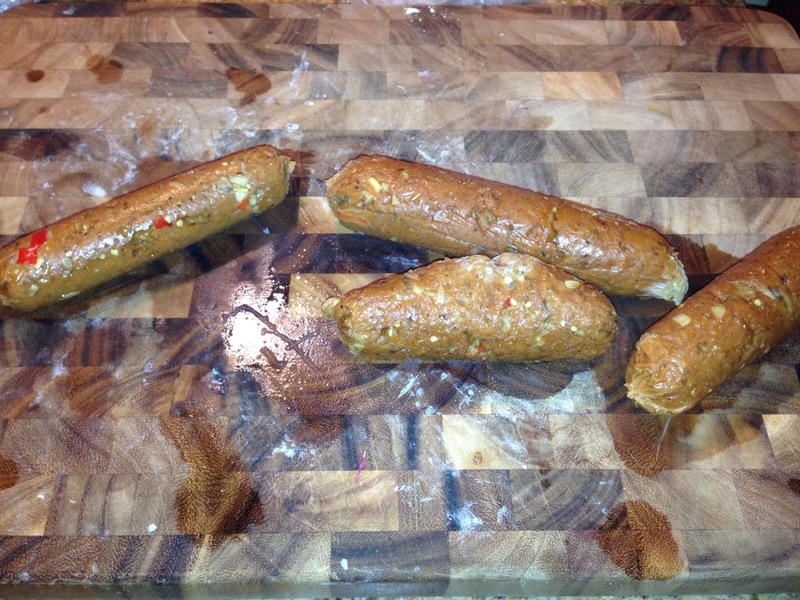 It is my take on Philly Cheesesteaks, inspired by the Vegan Zombie. Everything, except the buns, is made from scratch, so you’ll need to set aside a few hours the night before the game to make everything. Also, this doesn’t have to be made in the parking lot and can be made at home very easily. Great for away games! The key here is the tender, thinly shaved seitan and homemade herbed cashew cheese. 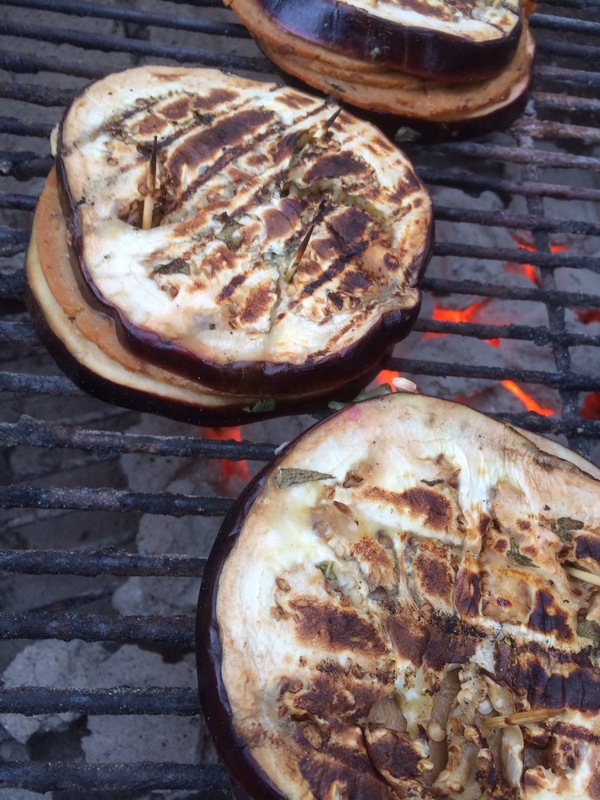 They pair together very well with grilled marinated peppers, onions and mushrooms. Load these sandwiches up the brim and expect a mess. We used a little BBQ or Sriracha on top and served alongside a roasted cauliflower and peanut salad with peanut dressing. Enjoy! 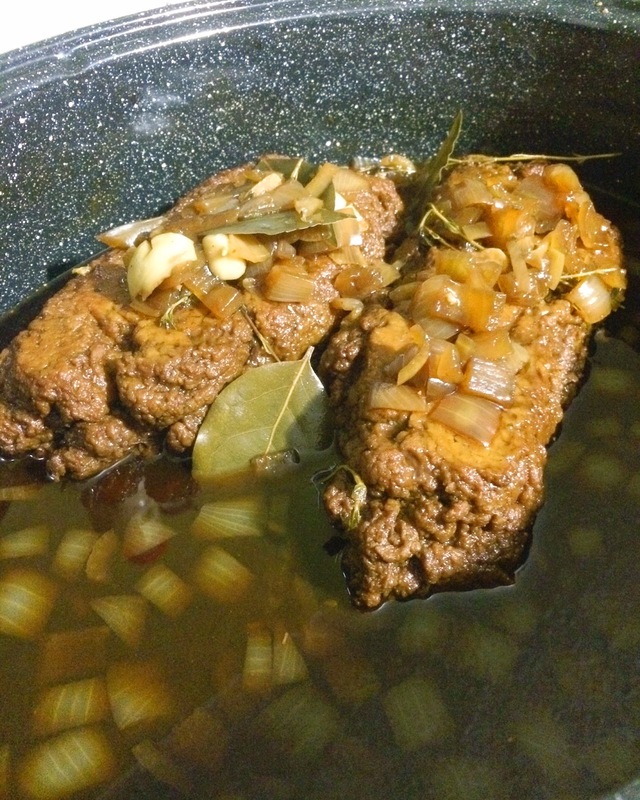 -Pour the stock in casserole dish to cover seitan. Cover and bake 375 for 45 minutes (Note: baste the seitan if it didn’t quite cover it every 20 minutes or so). 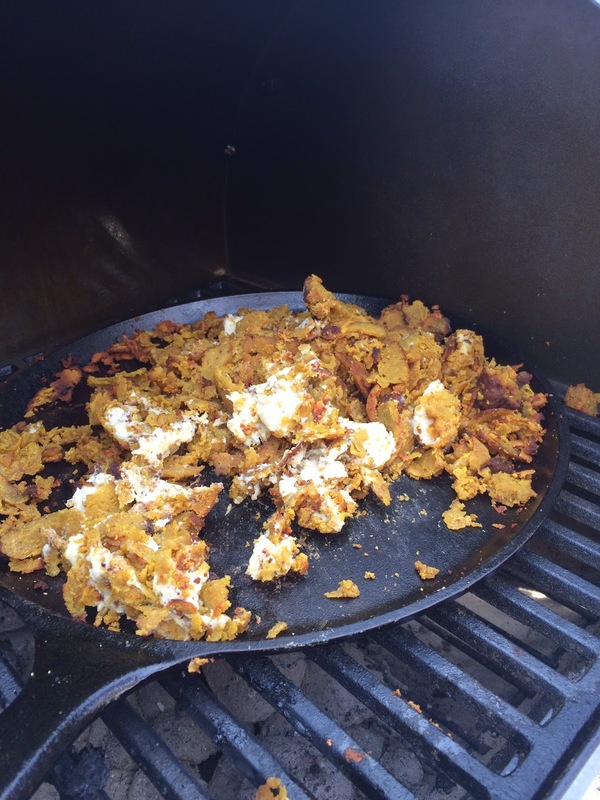 Then flip seitan and continue to cook for 45 hour uncovered. 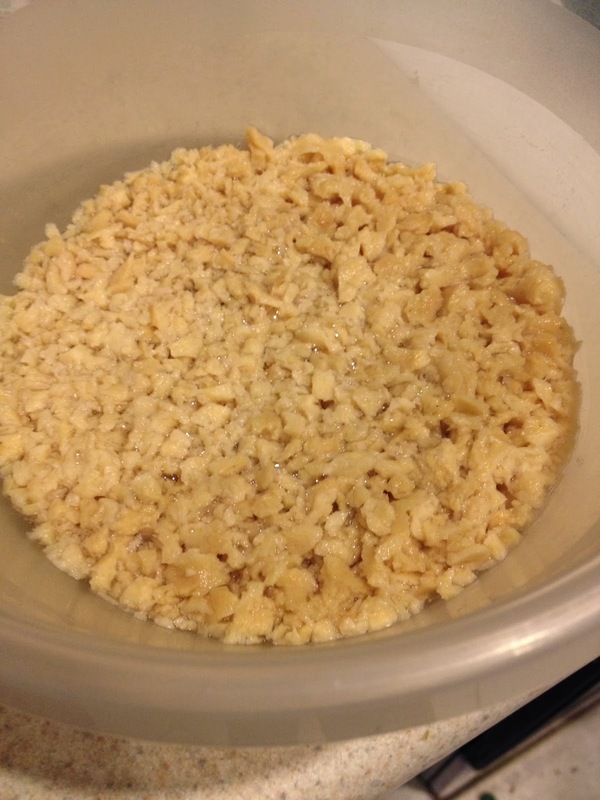 -Meanwhile make the cheese: Bring the water to a boil in a small saucepan and add the agar agar. Boil for one minute, stirring constantly. Turn down the heat to simmer and cook another 5 minutes, stirring constantly until the agar is dissolved completely. 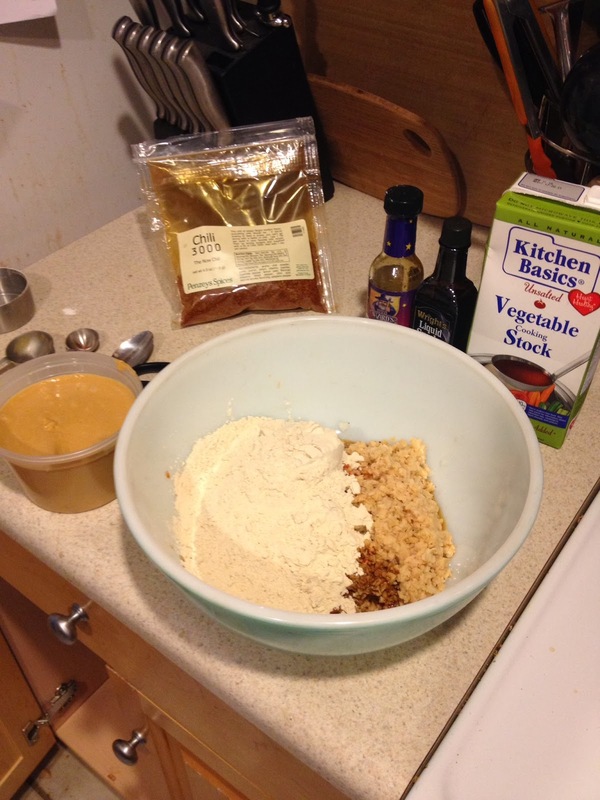 -Put the cashews into the blender with all the remaining ingredients. Pour in the agar mixture and Blend on high until very smooth. 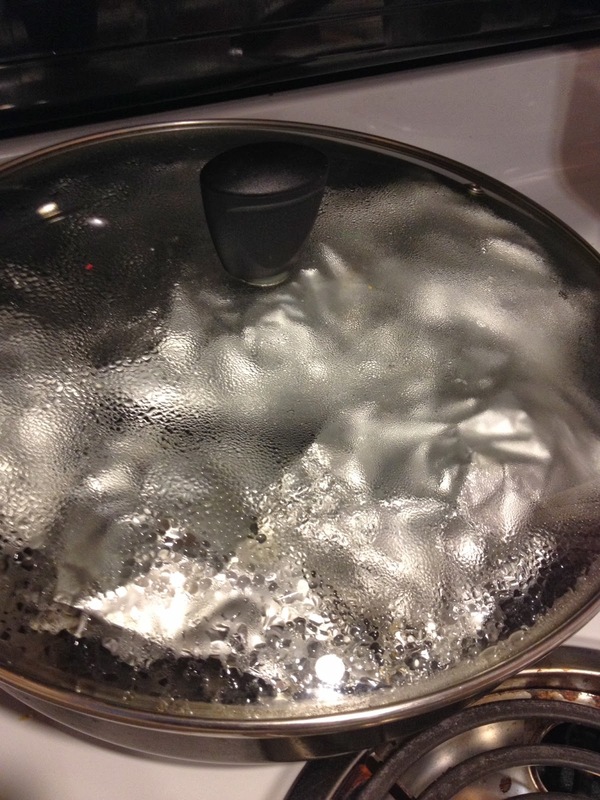 -Pour into a glass dish or non-stick pan (if you think it will stick then spray with vegetable oil.) Refrigerate until firm. Remove the cheese by running a knife or spatula around the edge and it will pop out of the container. 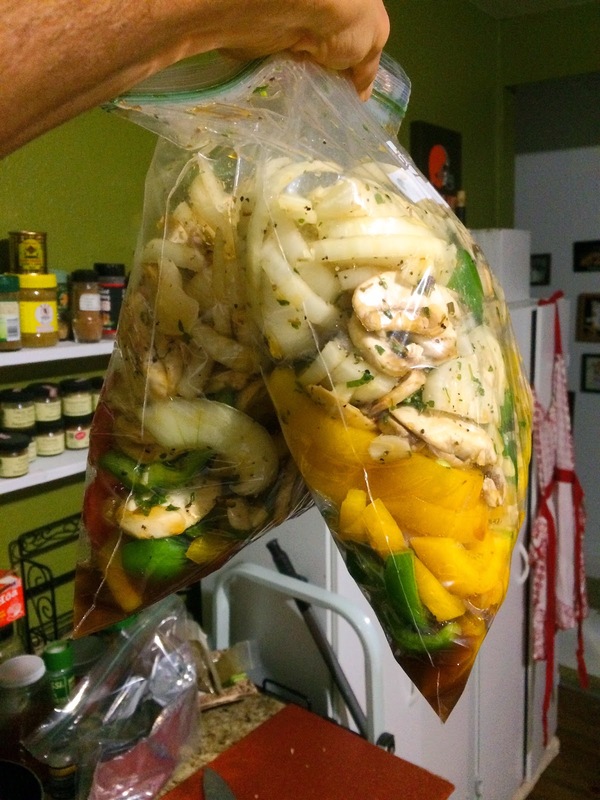 -For the veggies, slice the peppers, onions, mushrooms and garlic and place in a sealed bag or container. 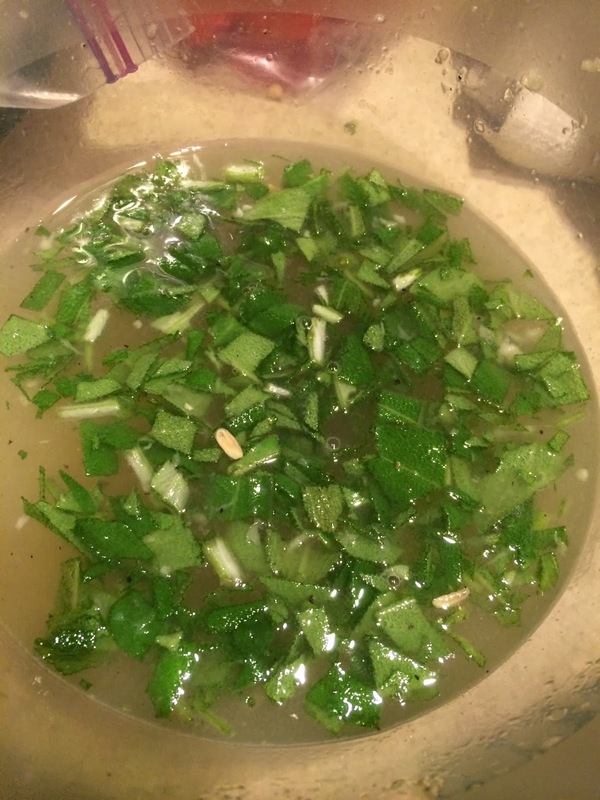 Add lime juice, soy sauce, agave, rice vinegar and herbs and let marinate until ready to grill. 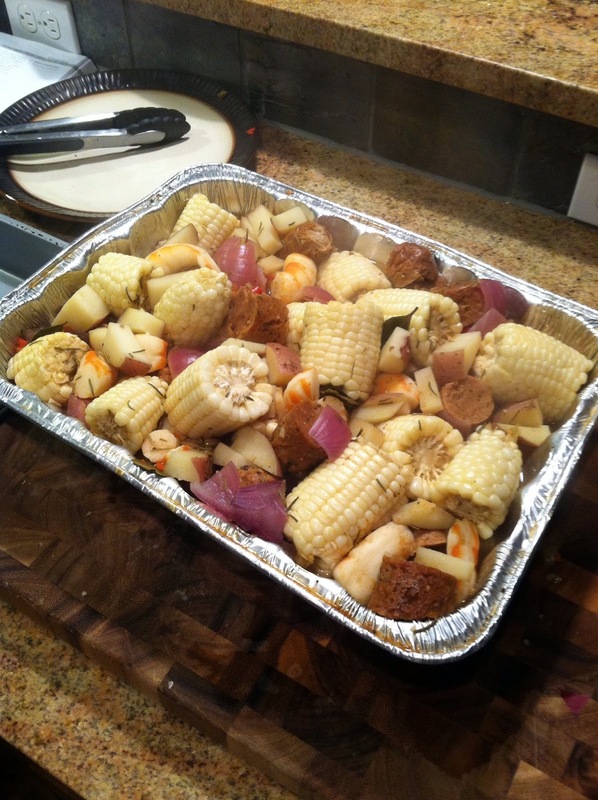 -Once the seitan is done, let cool and wrap up in foil, along with cheese, until its tailgate time. 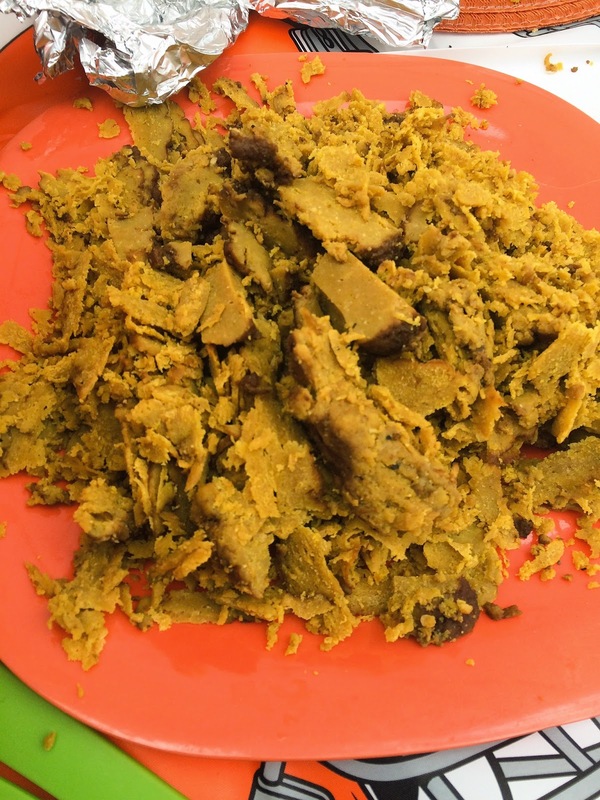 -Shave the seitan using a grater or sharp knife. 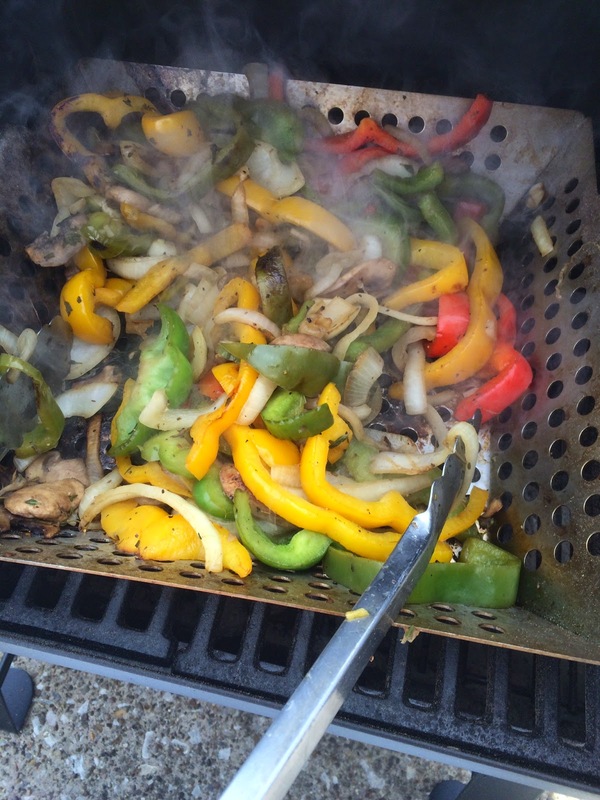 Grill in a grill pan or cast iron skillet. 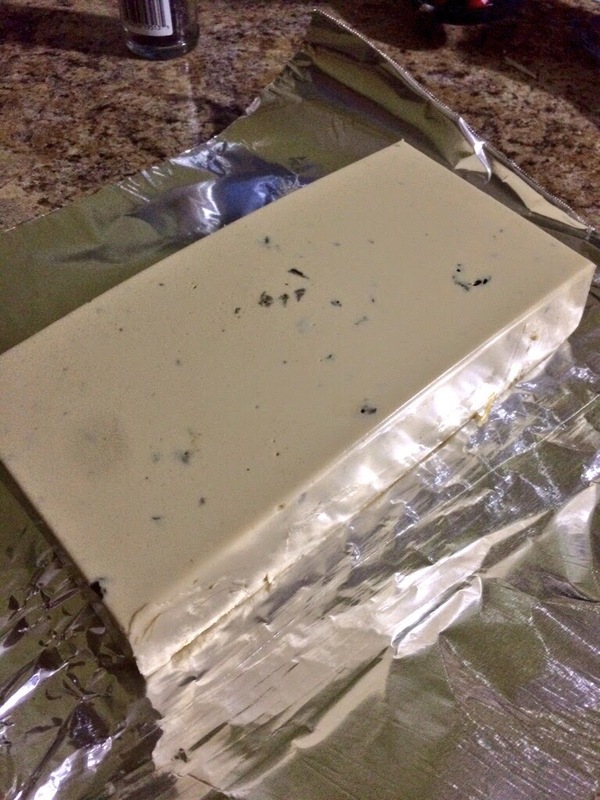 -Grate this cheese using a box grater. 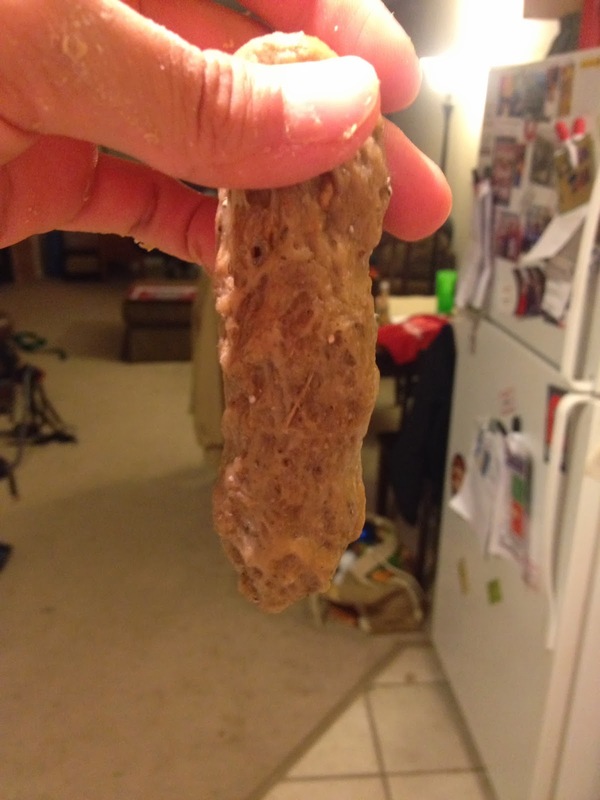 toss on the seitan in the last few minutes to soften. Ready to take a bite! 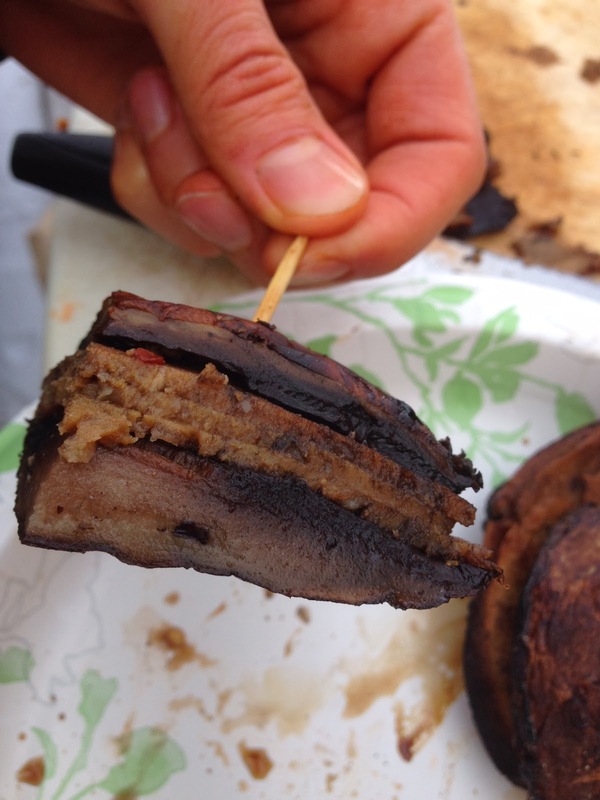 My latest recipe for my Field Roast Cooks in the Field blog is up! Check it out on the Field Roast website here. In the meantime, the recipe is also listed below. I made these at a sub zero tailgate. It was nearly impossible to use my hands and I had to run over to warm them up over the grill every couple minutes to prevent frostbite. 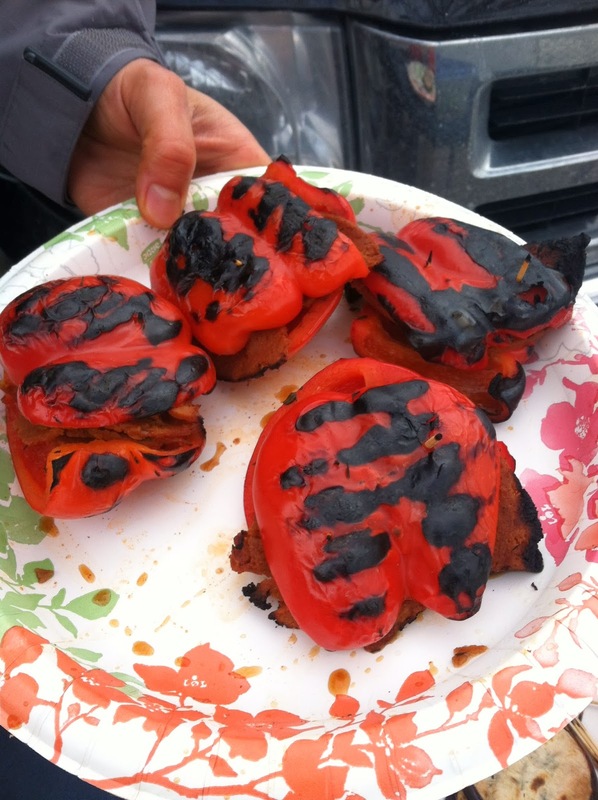 Hopefully you have better grilling conditions. These “stackers” are like grilled sandwiches with marinated vegetables standing in for the bread. 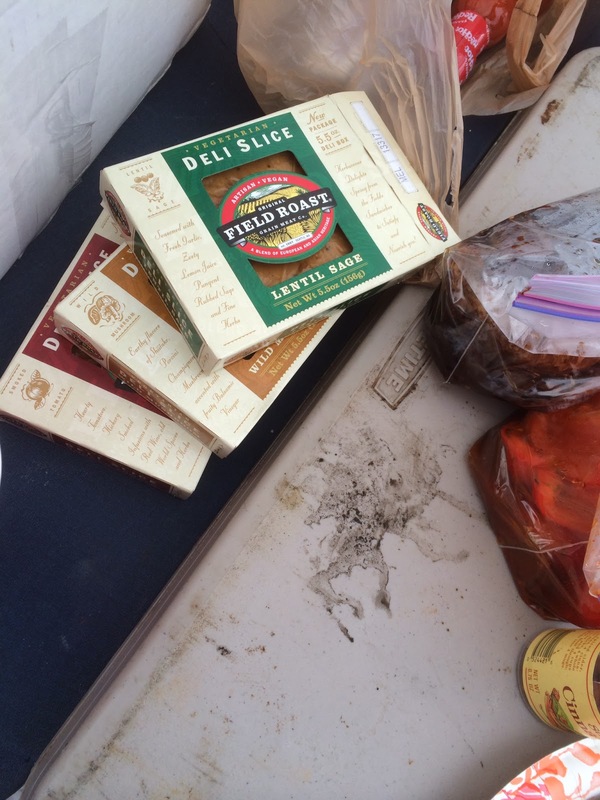 Using the Field Roast deli slices as the meat, the stackers are an attractive appetizer at any tailgate. With three different kinds to choose from, there is something for everyone. Enjoy! In 3 separate mixing bowls, coming the ingredients for the 3 marinades and stir. 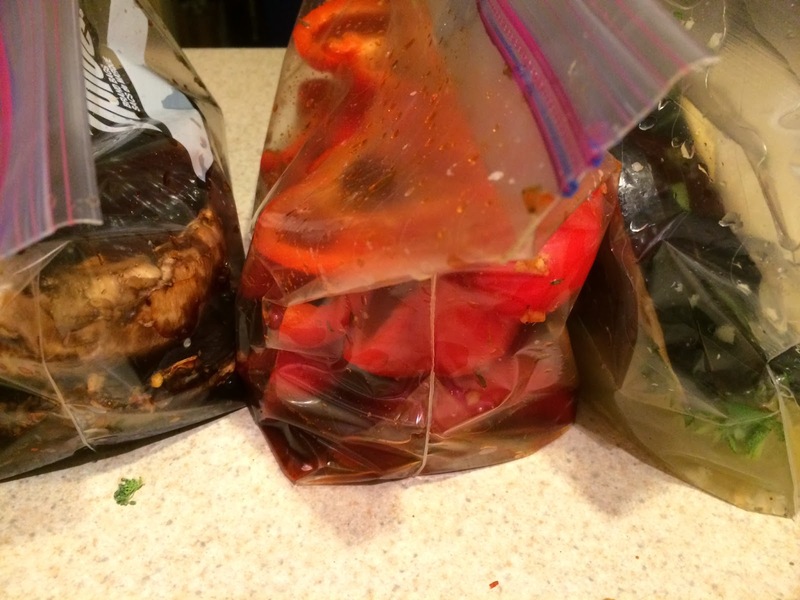 Place the veggies in an airtight container or bag with the marinade for at least 2 hours, preferably overnight. 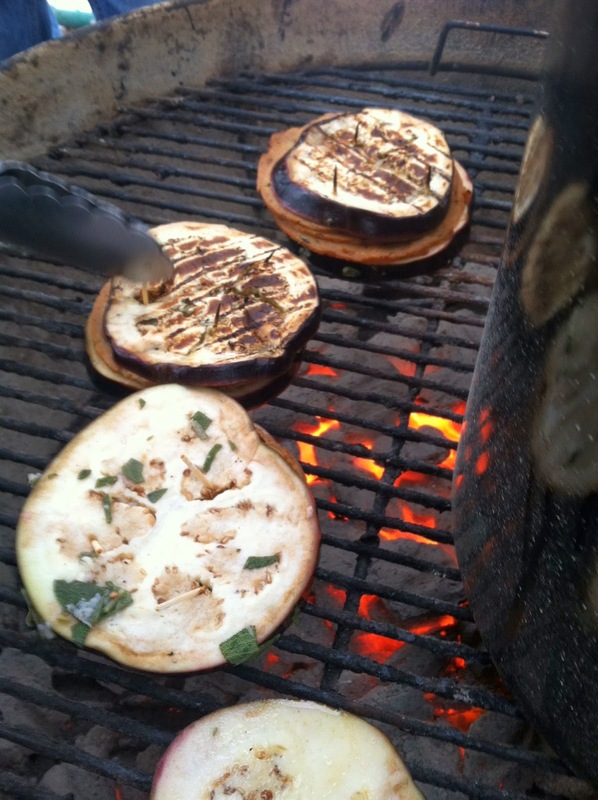 Grill for 4-5 minutes per side or until charred. 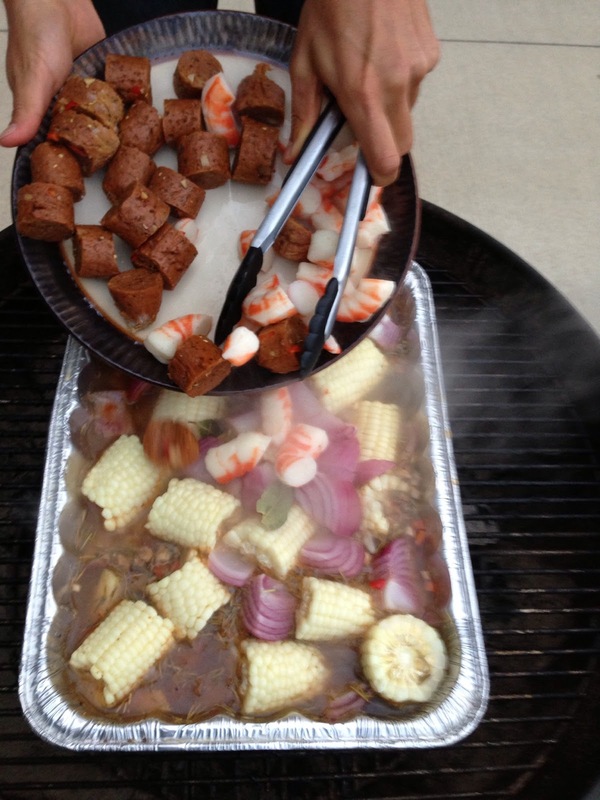 Cook time will vary based on the heat of the coals. Sorry for the delayed posting. 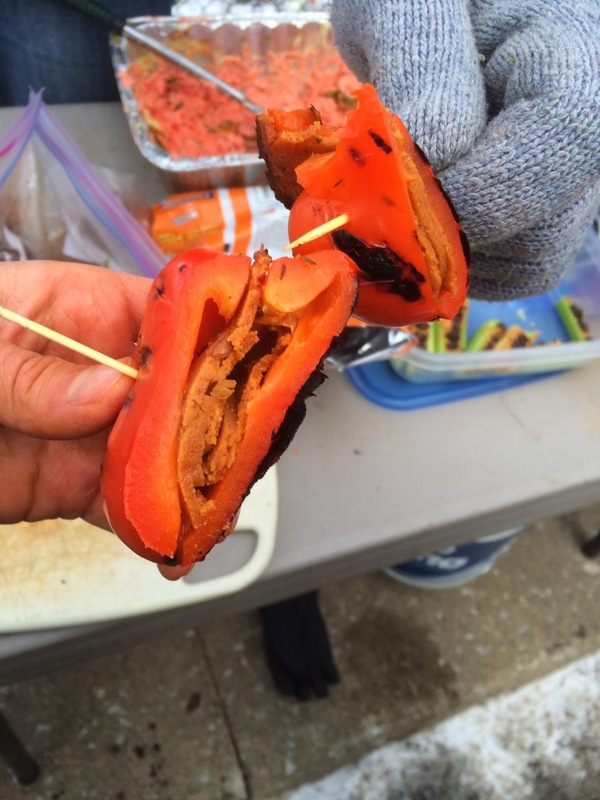 I made these veggie burgers at an impromptu apartment tailgate before the Thursday night game last week. 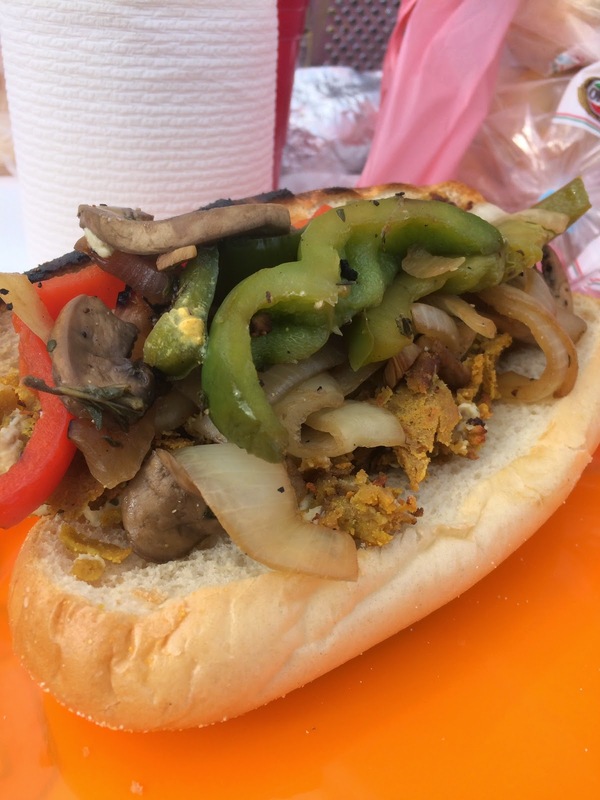 Vegan tailgates are known for veggie burgers, but they don’t have to be tasteless and boring like those depicted in the recent Bud Light commercial. 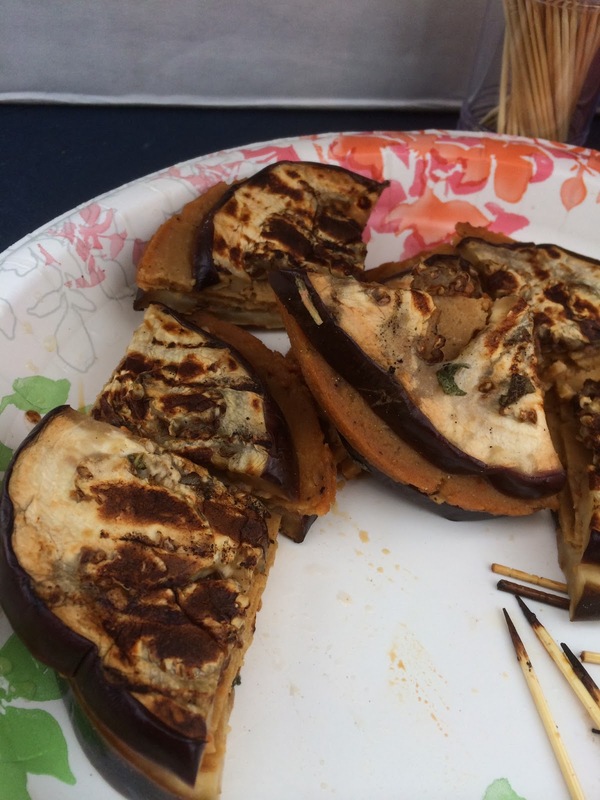 This recipe comes come from vegan grilling legend (and Clevelander) Tamasin Noyes. When I met her a few months back, she insisted I try my hand at making this burger. She said it delighted many meat eaters and vegans alike. The technique is the same, but as you can see my recipe varies quite a bit. What sets it apart is its meaty texture. 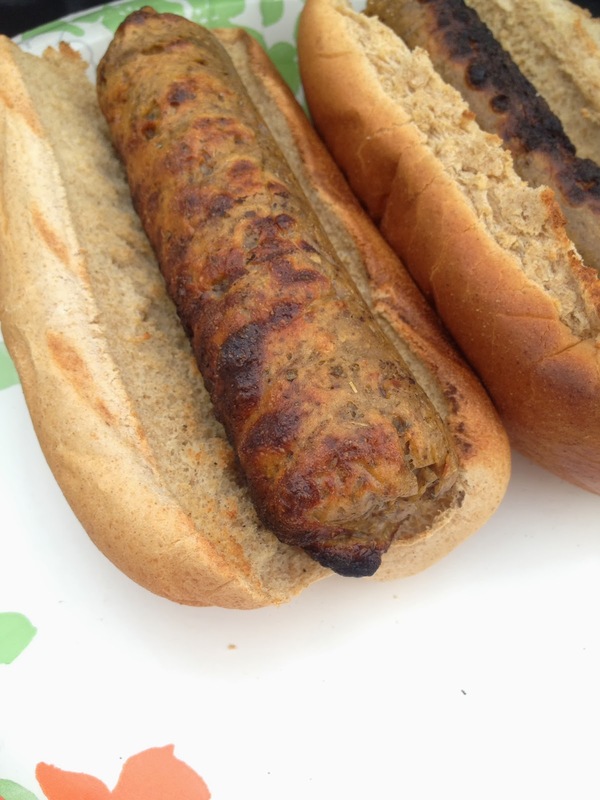 The TVP gives it a ground beef appearance and the vital wheat gluten holds it together. 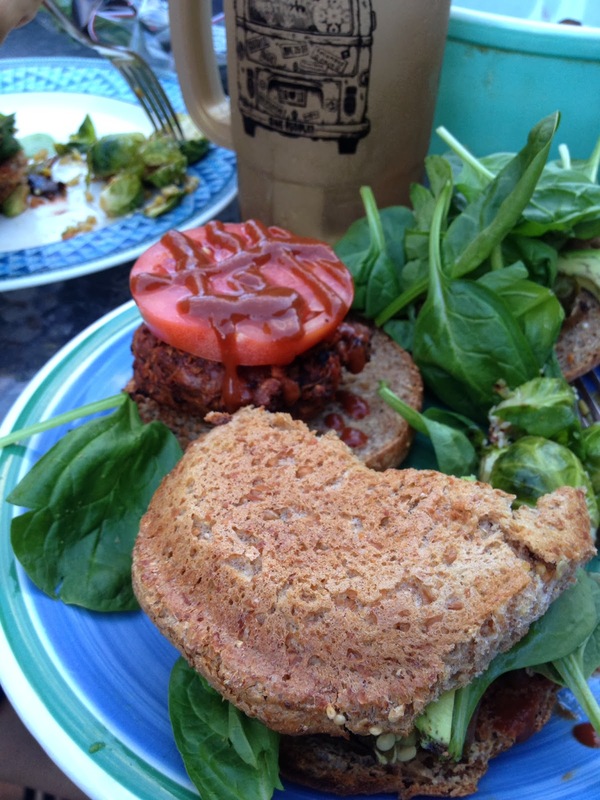 Like most veggie burgers, the flavor is really customizable with the spices and the liquid smoke and vegan worcestershire add a great burger taste. Enjoy! 1. Combine the hot water with the TVP to rehydrate, about 10 minutes. 2. 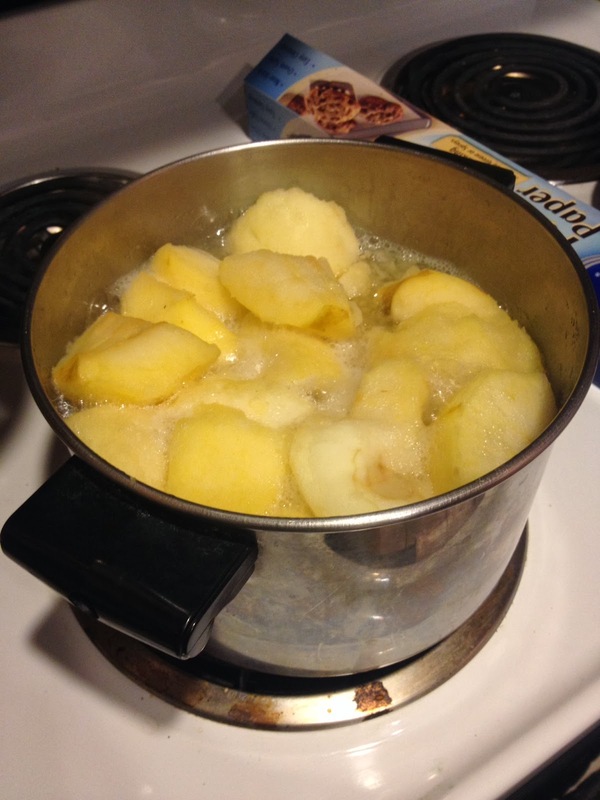 Add rehydrated TVP to a large bowl with the remaining ingredients (in the order given). 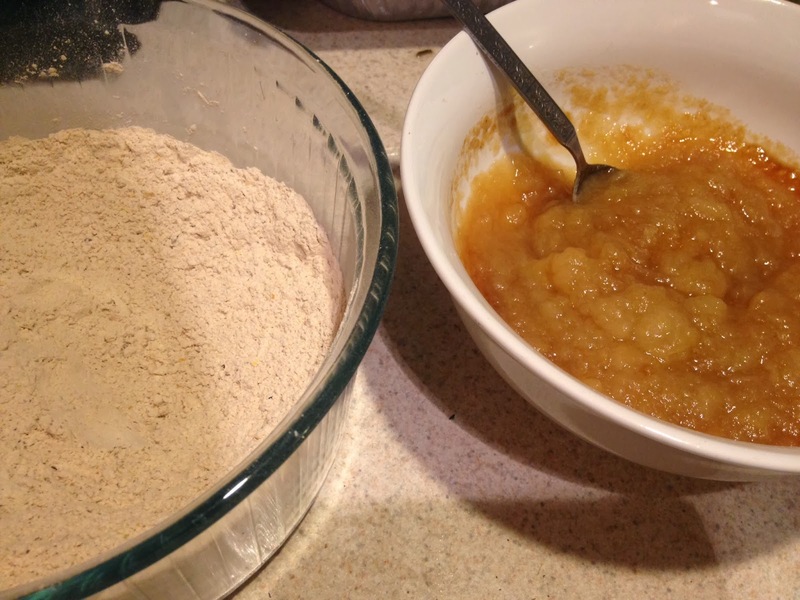 Mix well, and knead for about 3 minutes. 3. Divide and shape the burger into 6 patties. Place each burger in the center of a piece of foil. 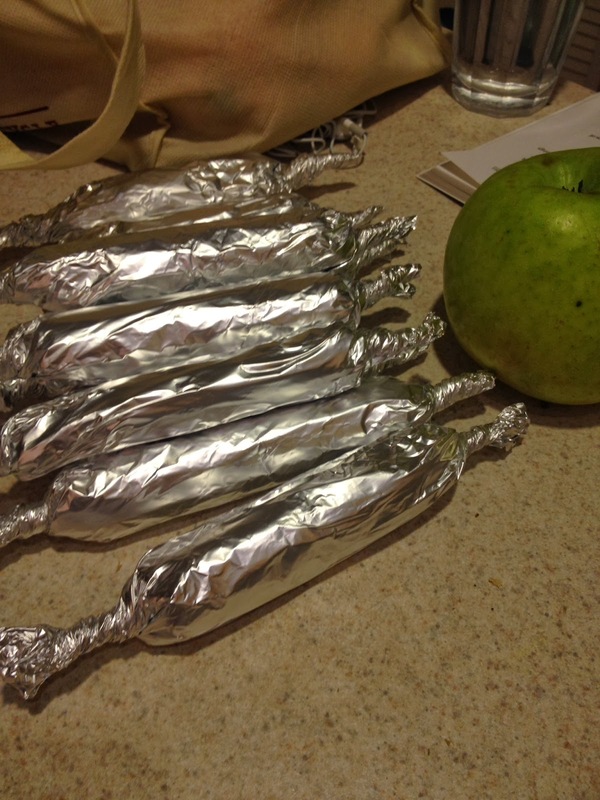 Fold the foil over each burger to make a packet. (Note: Don’t make the foil too tight in order for the burger to expand. 4. 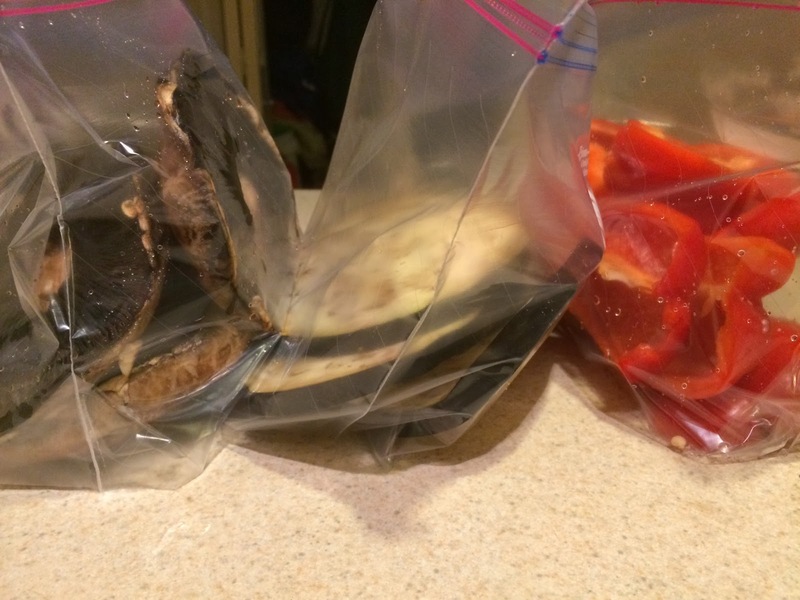 Transfer wrapped burgers to a steamer (or a steamer basket inside a covered pot/pan) and steam 1 hour. 5. 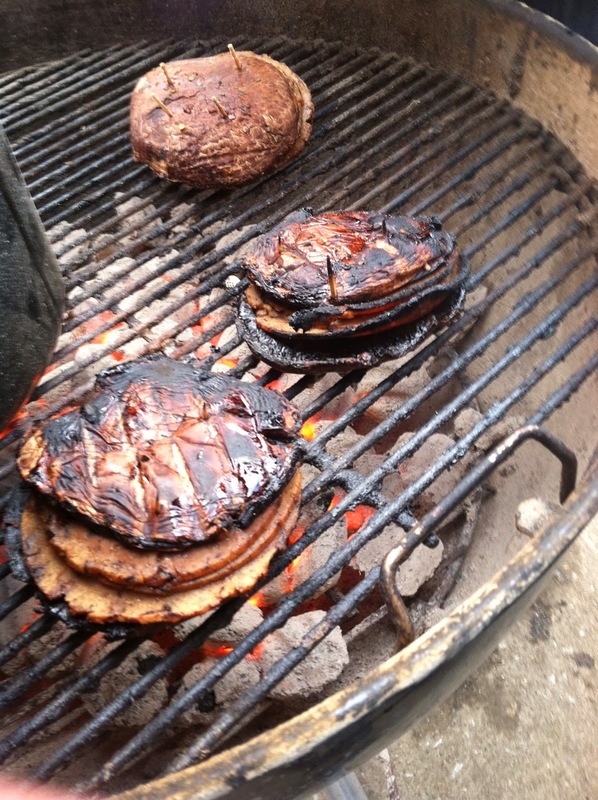 Unwrap and transfer the burgers to a plate and refrigerate for 1 hour. 6. 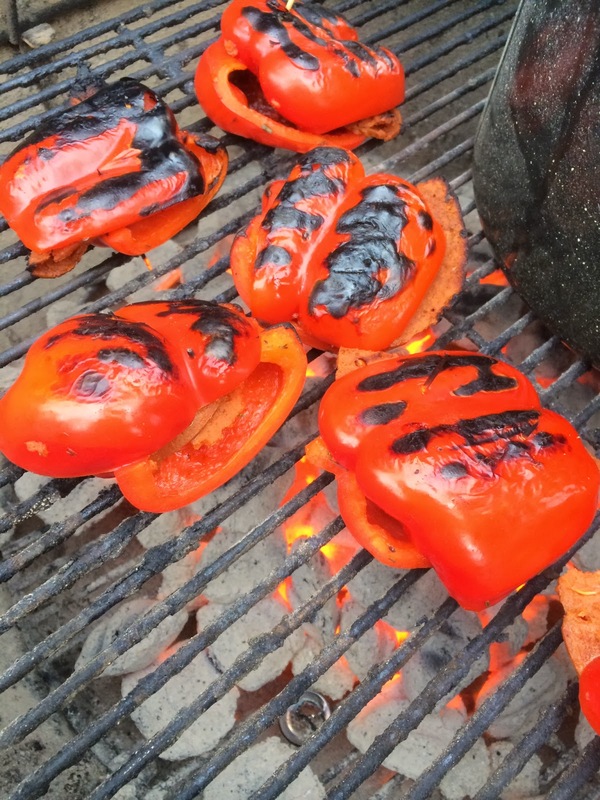 Throw them on the grill! Make sure you oil your grill grate. Cook about 5 minutes per side. Tailgate season is back! 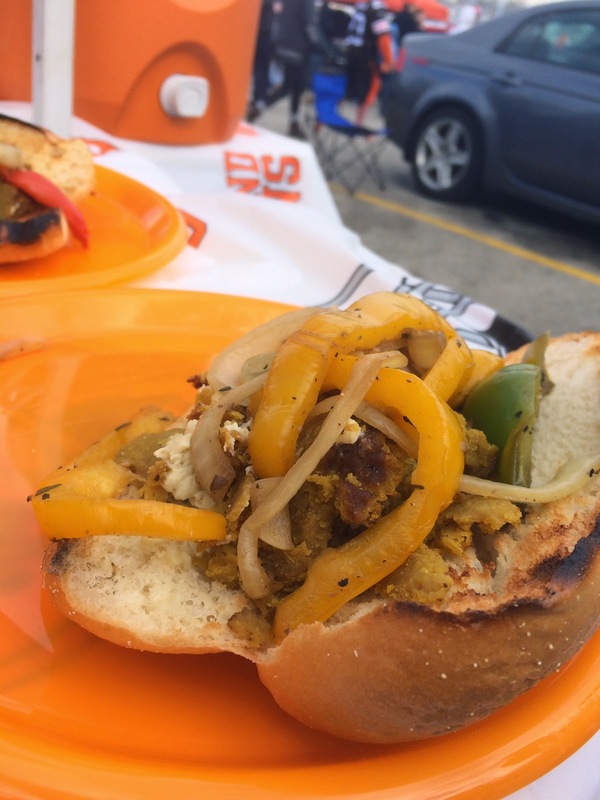 We had our first vegan tailgate of the year this past Sunday at the Muni Lot in Cleveland. 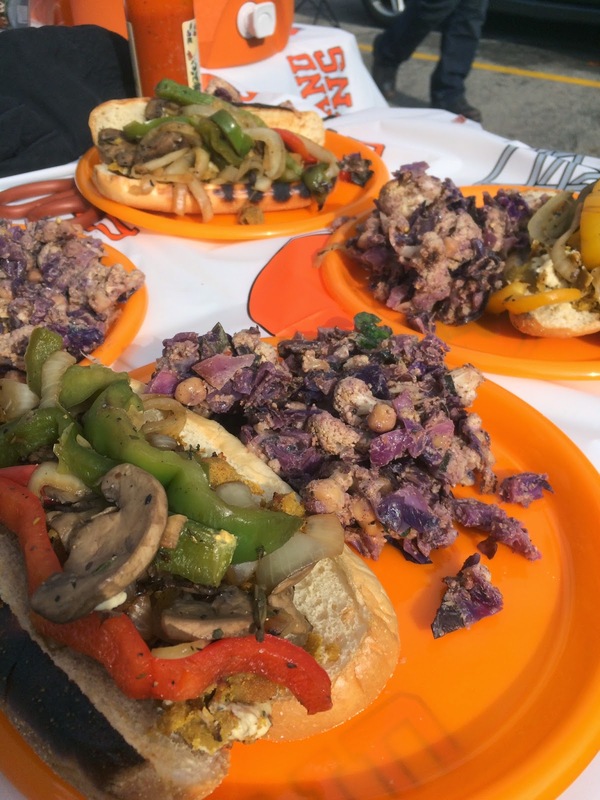 The nice weather, blind optimism about the season and amazing food made for a great atmosphere (we won’t talk about what transpired on the field). I purchased some chocolate habanero peppers at the Tremont Farmer’s Market last week just because I thought they looked cool. This Amish guy sells a huge variety of hot peppers and I am always talking myself into buying them. I ended up using an entire pint of them in this BBQ sauce for the seitan ribs. 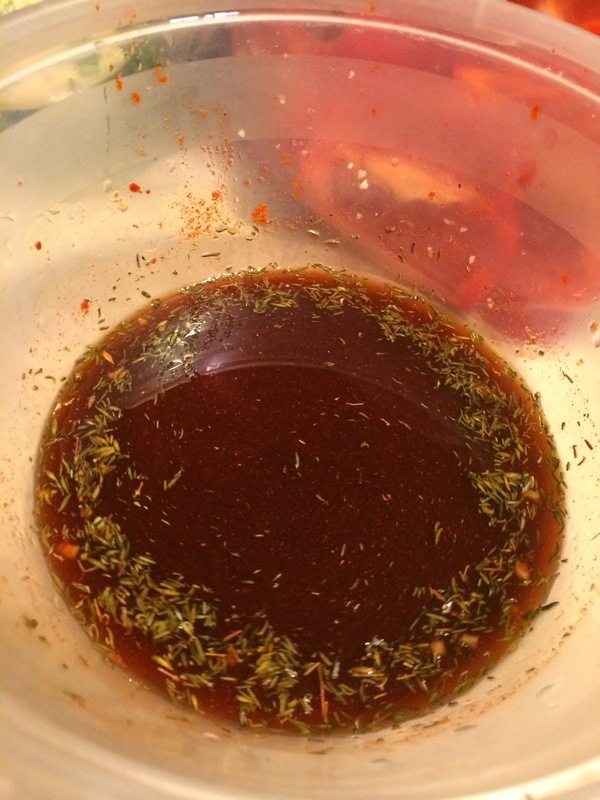 The recipe for this sauce came off the top of my head, which I plan on doing more of this season. Getting inspiration from the amazing vegan community is all well and good, but I want to contribute my own personal flare to the vegan scene. Sauces are vital for tailgates. 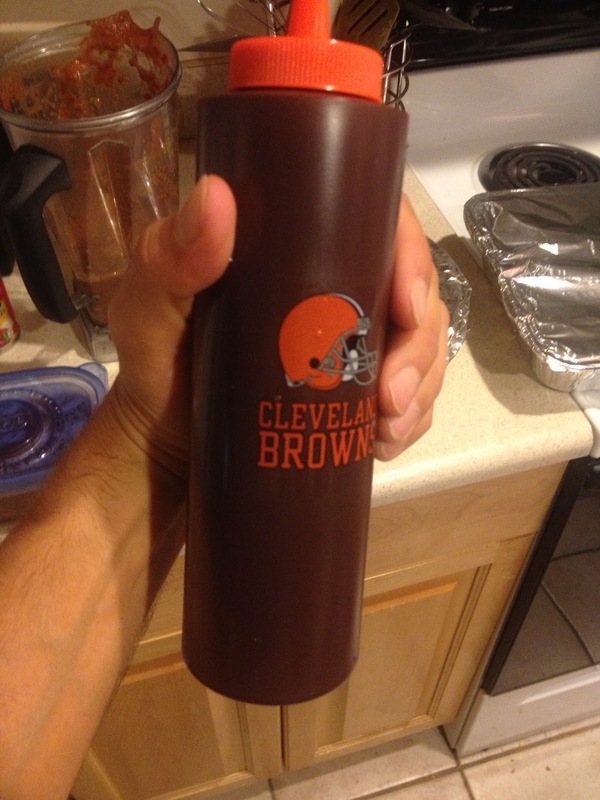 So much so, I have been collecting sauce bottles this offseason with the intention of making at least one homemade sauce per tailgate. I will post several sauces on the blog throughout the season. There is little value in buying a sauce at the store. Name the last time someones eyes lit up at a bottle of ketchup or honey mustard. They are usually loaded with ingredients you can’t pronounce to preserve its color and flavor. Yuck. 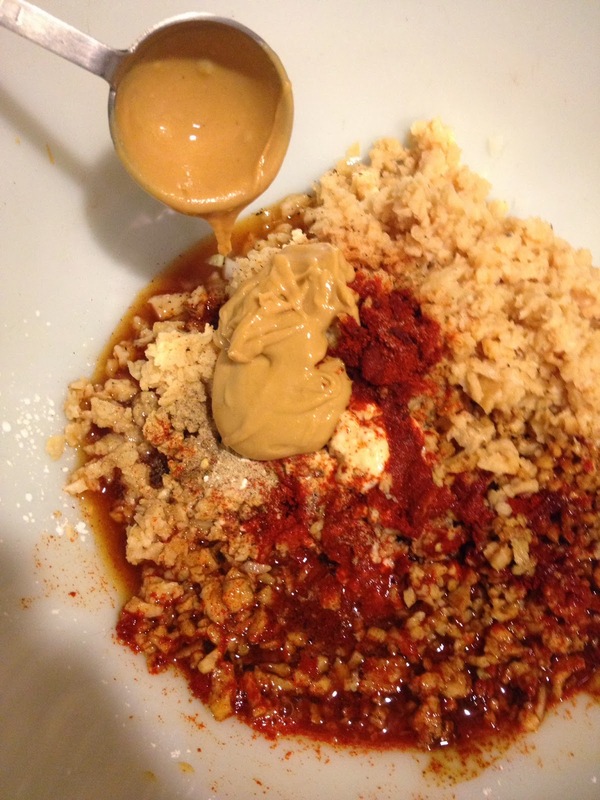 There is nothing like making your own variation of your favorite sauce, like this twist on my favorite sauce, BBQ. I’ve been dabbling in making BBQ sauce since my college days. It is really quite simple because it involves a base number of ingredients and the rest is fully customizable. 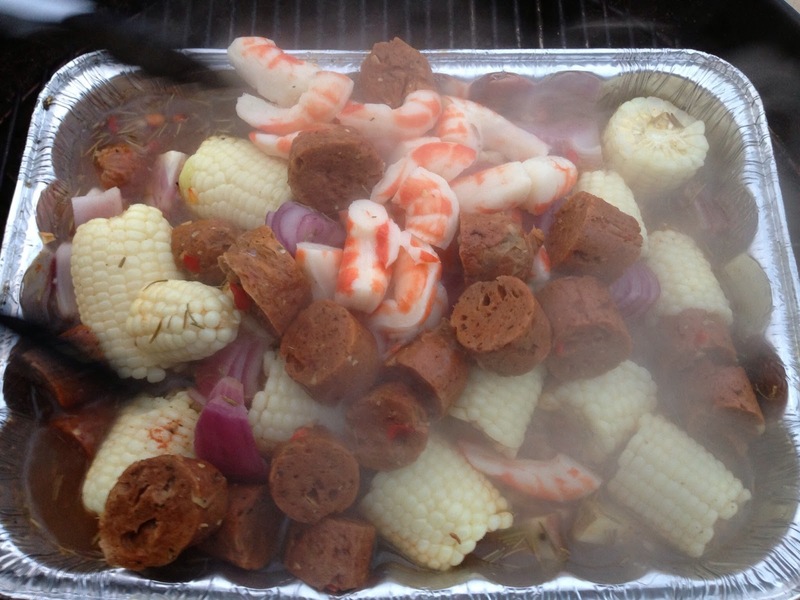 Don’t let the thought of making your own BBQ scare you… its very easy! 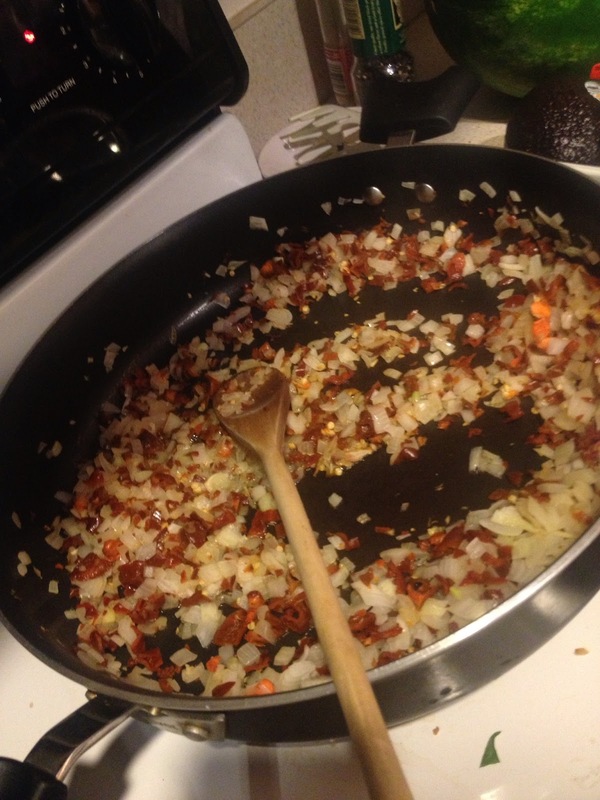 It involves sauteing finely chopped onions/garlic/peppers and adding them to tomato sauce/ketchup/puree with several key additions like apple cider vinegar, liquid smoke, ground mustard, vegan Worcestershire (no anchovies! 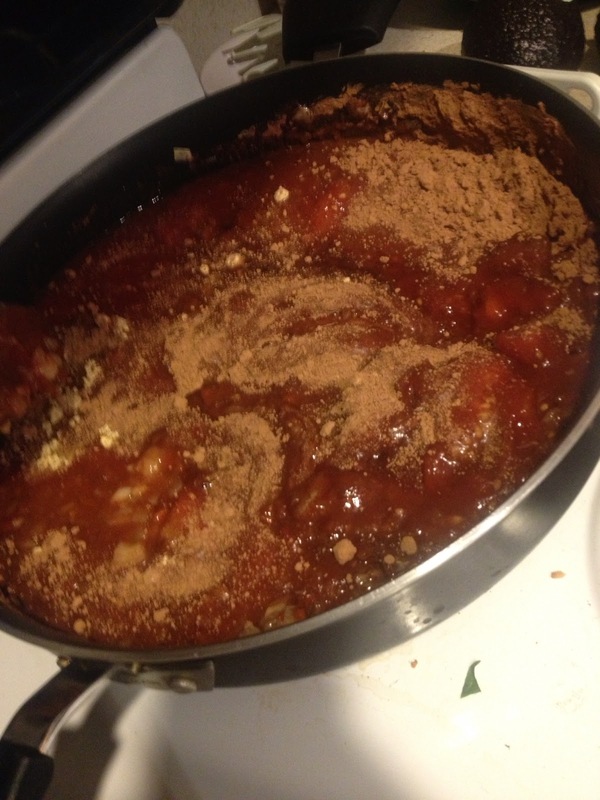 ), brown sugar or agave and other spices like paprika, cumin or oregano. 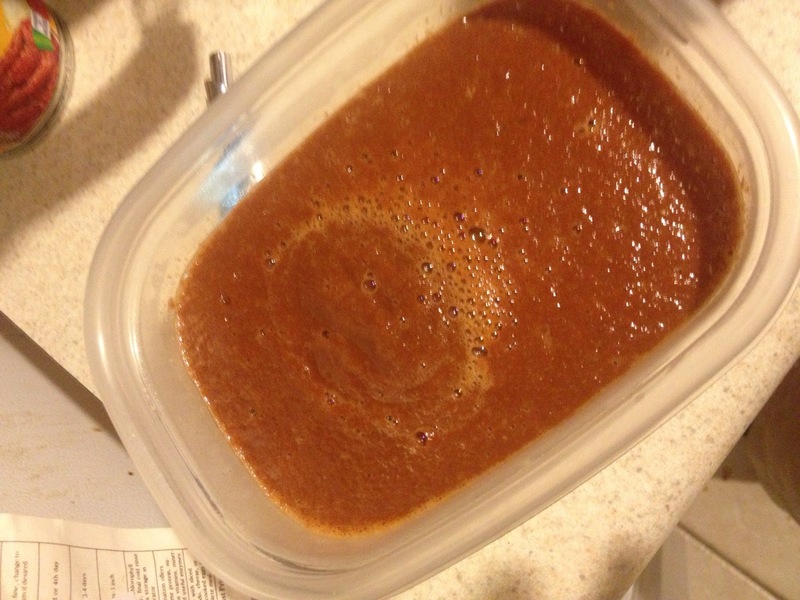 Don’t worry if you can’t get chocolate habaneros for this sauce, any variety will do. Its brings the heat, so enjoy! Let simmer for 30 minutes on low heat being careful not to splash or burn the bottom of the pot. Optional: transfer to a blender and blend until smooth. Some people like it chunky, so this step is optional.